One of the most common hazards in any home is the simple kitchen fire. They often don't do a lot of damage, but they can be scary. Like home insurance, a fire extinguisher protects you from the aftereffects of a fire. Invest in one rated for A (trash, wood, and paper), B (liquids and gases), and C-type (electrical) fires. In the absence of a proper extinguisher, the information below will help you deal with kitchen fires. Fire needs oxygen to exist, so the quickest way to douse a flame is to let it burn up all the available oxygen. One way to do that is to cover the pot or pan with a lid. Similarly, if a fire ignites in your microwave or your oven, do not open the door. Opening it feeds the flame by providing more oxygen, so leave the door shut to let the flame suffocate. Water is effective on regular kitchen combustibles such as dish towels and potholders. If one of these catches fire, throw it into the sink and turn on the faucet. However, never try to use water to douse a grease fire. It will spread the grease—and thus the fire—around, which makes the situation even more dangerous and increases the amount of your home insurance claim. Grease fires are exceptionally dangerous because they spread so easily. Although water makes the problem worse, you can douse a grease fire by pouring salt or baking soda on it. Both are non-combustible and smother the flames in the same way that kicking dirt or sand on a campfire does. This is another good reason to keep these two items handy in your kitchen at all times. 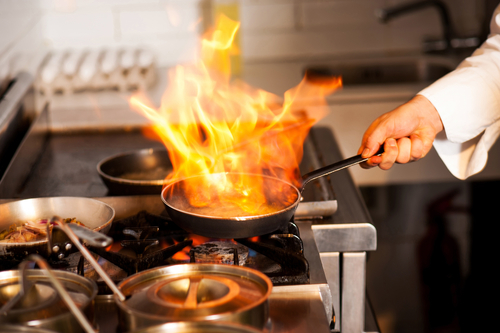 To guard your home against the financial losses of a kitchen fire with high-quality home insurance, contact Cundiff & Company Insurance in Somerset, KY. They've been advising individuals and businesses throughout Pulaski County for more than 40 years. They also specialize in motorcycle, truck, and auto insurance, and they provide their clients with a lot of options and personal service. Visit their website to learn more about their home insurance options, and call (606) 679-8379 to request a quote.